Kagera Region is one of Tanzania's 31 administrative regions. The region is located in the northwestern corner of Tanzania on the western shore of Lake Victoria. The region neighbors Uganda, Rwanda, and Burundi and lies across the lake from Kenya. The region was known as the West Lake Region before June 1979. The regional capital is the city of Bukoba. According to the 2012 national census, the region had a population of 2,458,023, which was lower than the pre-census projection of 2,763,329. For 2002-2012, the region's 3.2 percent average annual population growth rate was tied for the third highest in the country. It was also the ninth most densely populated region with 97 people per square kilometer. On September 10th 2016, the region was struck by an earthquake measuring 5.9 on the moment magnitude scale. It was the biggest earthquake to have been recorded in Tanzania. 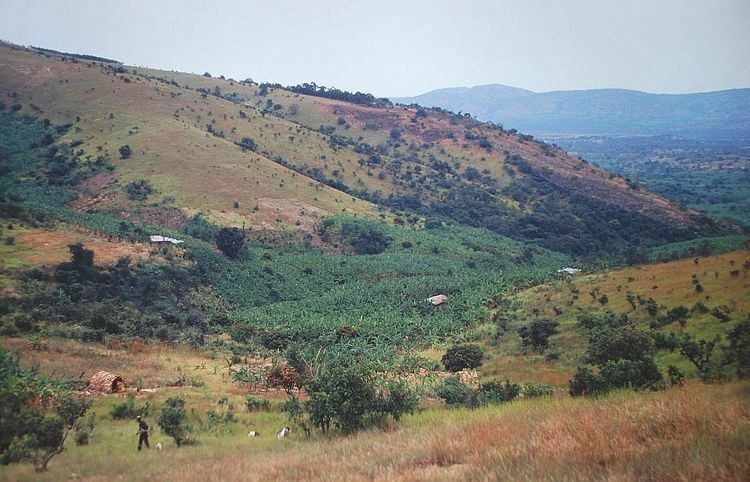 The Kagera Region is located in the northwestern corner of Tanzania. The regional capital is Bukoba, which is about 1,400 kilometres (870 mi) from Dar es Salaam by road. The region shares borders with Uganda to the north, Rwanda and Burundi to the west, the Kigoma Region to the south, and the Geita Region to the east. The region is known for its agriculture, its beautiful lush landscapes, and its wildlife. The Kagera River forms the region's border with Rwanda. 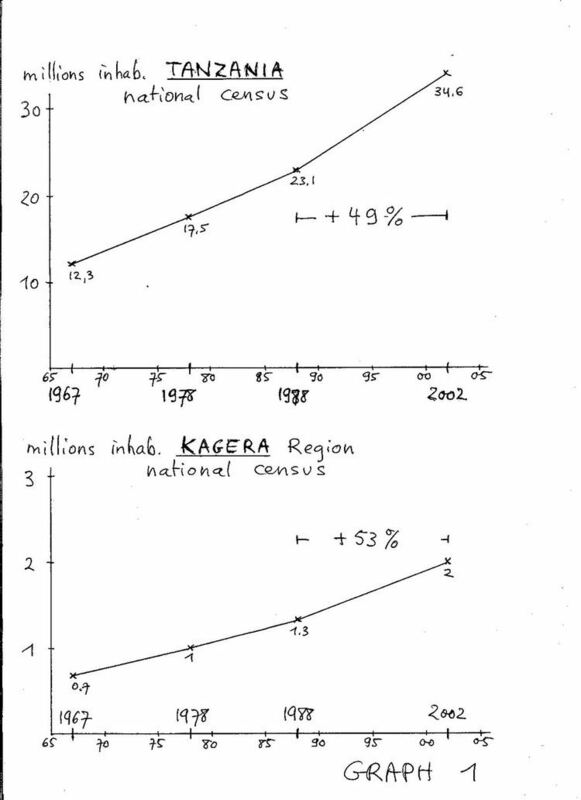 Kagera Region lies just south of the equator between 1°00' and 2°45' south latitudes. Longitudinally, it lies between 30°25' and 32°40' east of Greenwich. Out of the region's total area of 40,838 square kilometres (15,768 sq mi), 11,885 square kilometres (4,589 sq mi) is covered by the waters of Lake Victoria, Lake Ikimba, Lake Burigi, and the Ngono and Kagera rivers. The region's total area is just 446 square kilometres (172 sq mi) less than that of Switzerland. The Kagera Region is Tanzania's fifteenth largest region and accounts for approximately 3.3 percent of Tanzania's total land area of 885,800 square kilometres (342,000 sq mi). It has reasonably fertile old soils, but overuse in some parts of the region has led to soil exhaustion and a need to use fertilizer. Kagera region was formerly known as West Lake region. It was renamed Kagera region after the Uganda-Tanzania War when Idi Amin attempted to annex the region in 1978. The region takes its name from the Kagera River, which flows from Rwanda through northern Tanzania before it enters Lake Victoria, to emerge as the Nile, the longest river in the world. For a period of about five centuries Kagera Region were split into nine different kingdoms with a highly hierarchical society. Before European colonialism, coffee was a traditional crop in the area, used for its stimulant properties and in local cultural rituals. It was during colonial times time that coffee was transformed into a cash crop. Bananas were used as a staple food in the region, long before the White man came. Although there was a gender based division of labour in the traditional Bahaya society, women of the time were not thought to be inferior to men and were not treated as virtual slaves. In fact women commanded special respect in all traditional rituals. For example, during the upon the death of a head of a family (Nyin'enju), during the following inheritance rituals the "Main Inheritor" (Omusika) had to have a female counterpart selected from among his sisters to share his authority. Similarly, upon the death of a reigning King, during the crowning of the next King, there had to be a "sister to the nation" (Kinyany'engoma" who was also selected from among his sisters. The kings lived in elaborate palaces and were respected as the direct link to gods of their kingdoms. The authority of the nine kingdoms (Kihanja, Karagwe, Kiziba, Misenye, Bugabo, Kyamtwara, Ihangiro, Bukara and Biharamulo) were diminished when Germans colonized Tanganyika in 1885 and supported the Haya, the ethnic group of Bukoba and Muleba Districts over the other districts. However the local kings held on to power. The demise of these kingdoms came after Tanzania gained its independence and president Nyerere saw them detrimental to national unity. There was a chief called Omukama (the word meant a king or chief)who could be born with that authority. Some prominent chiefs who are known in Kagera include Kyamukuma who is a last chief in Misenye (Currently Missenyi District) as Written By the Author Seth, Niyikiza [The new Haya Transformation, The legacy of Babumbilo (2014)]. Other chiefs include Rumanyika of Karagwe, Ruhinda, Kahigi and other inferior chiefs. Kahigi is among of chiefs who waived their territories by corroborating with Germans colonialists. Cultural tours are available for tourist visiting Kagera and can be accessed from the regions capital Bukoba. These tours include visits to the regions national parks/nature reserves etc.. It was under German rule that Dr. M. Zupitza, then serving as the local medical officer, encountered the plague outbreak in Kiziba (1897–1898). In cooperation with Dr. Robert Koch, they confirmed that the cause was the very same bacteria as the outbreak in Bombay. When authority was transferred to the British who supplanted the Germans, Kagera was open to Lutheran missionary activity. Other Christian denominations including the Roman Catholic church later arrived. Their legacy is seen in the many churches in the region. The Kagera Region has a vast amount of wildlife, including baboons and other types of monkeys. Kagera Region hosts Biharamulo, Burigi, Ibanda and Rumanyika and Orugundu Game reserves, a National Park situated on Rubondo Island and a wildlife sanctuary based on Saa Nane Island. Akagera National Park is located near the region inside Rwanda.